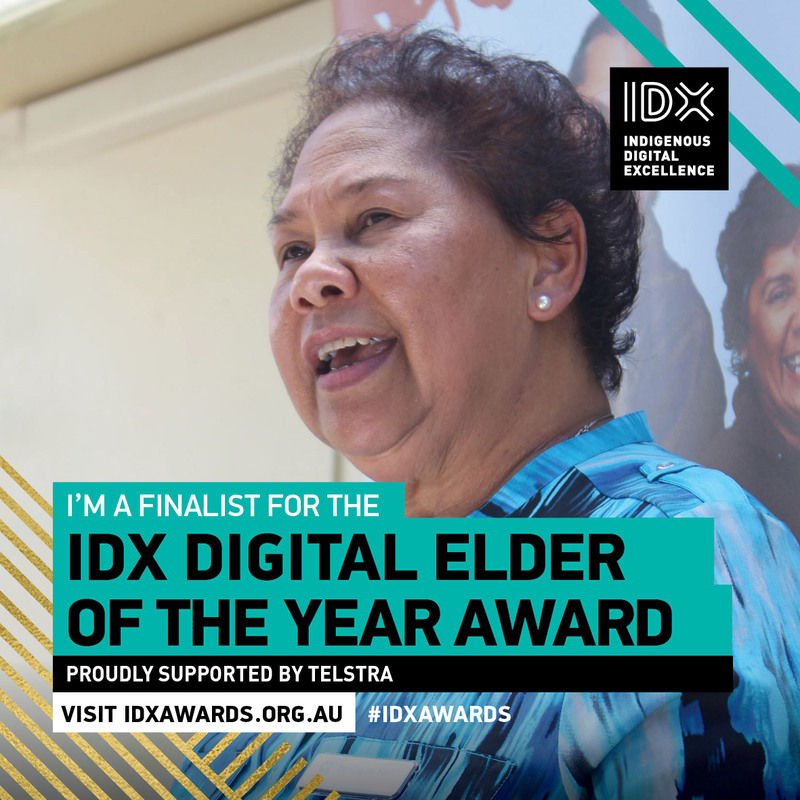 Patricia Elarde is a finalist for the IDX Digital Elder of the Year Award proudly supported by Telstra. The Digital Elder of the Year award is proudly supported by Telstra and celebrates an Elder who has demonstrated excellence in the digital landscape. Patricia is a Torres Strait Islander woman from Murray Island. As the Aboriginal and Torres Strait Islander Program Manager for Diabetes Queensland, Patricia is passionate about providing health education in a friendly and interactive way to empower people to understand and manage their care. Patricia pushes the digital frontier to explore new ways for her community to be engaged with their health. Recently Patricia worked in collaboration with Hitnet to develop a range of digital resources to promote health and wellbeing messages for Indigenous Australians and their families affected by diabetes. What do you find most rewarding about your work? The opportunity to advocate and represent our people at a state and national level and that I have opportunities to promote the work that provides culturally appropriate programs for Aboriginal and Torres Strait Islander people living with diabetes or at risk of diabetes. What have you found most challenging or exciting? To contribute to the better health outcomes of Aboriginal & Torres Strait Islander people. Establishing and fostering working relationships with a variety of key health organisations and people to promote diabetes education and training programs. The opportunity to reach more people through presentations at state and national conferences. I have worked at a national level with the then Department of Health & Ageing and with National Indigenous Peak Associations with a vision of growing the Indigenous workforce to support better health outcomes in communities. How and why did you get started? What was your inspiration? I have been working in Aboriginal & Torres Strait Islander Health for about 19 years in Canberra and Queensland; alongside work was my passion of sport through basketball at a local, state, national and international level. I love the satisfaction of seeing our people thrive for their aspirations and I welcome the challenge to support them through my many years of experience health and sport. Why do you think embracing digital technologies is important for Indigenous people and communities? Access to care and equality are fundamentally important to the survival of Aboriginal of Aboriginal & Torres Strait Islander people. In today’s modern world, we, too need a choice to develop relationships that will provide direction towards social emotional and wellbeing. We are a national of visual and oral stories that can spread the positives of living well with diabetes. What is your hope for the future? That disadvantage is diminished, reconciliation thrives, health outcomes improve immensely and we can live equally happily together as Australians. As a national priority leader for Aboriginal and Torres Strait Islander people, that there is a significant reduction in the prevalence of diabetes among Aboriginal & Torres Strait Islander people; that there are programs of prevention, care and management that are delivered culturally appropriately and are sustainable through building capacity within communities through knowledge and education of an Indigenous workforce. © National Centre of Indigenous Excellence . All Rights Reserved.